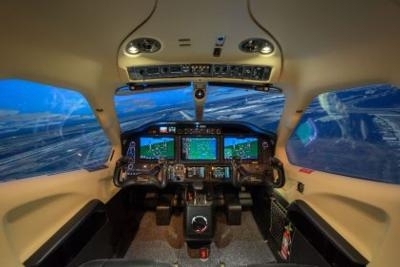 Frasca International has received a contract to supply a TBM910 Level 5 Flight Training Device (FTD) to SimCom International's training center located in Scottsdale, AZ. The FTD which will be built in an actual aircraft cockpit will be equipped with G1000Nxi with two PFD's and one MFDs including TAWS, weather radar, synthetic vision, traffic advisory system, ESP/SUP/EDM, real MD302 electronics standby instrument and enclosed Instructor Operator System (IOS) Cab. The FTD will include an RSI visual system with projected 220­° spherical display system. This will be the second TBM device provided to SimCom by Frasca. A TBM930 Level 5 FTD was delivered in 2017.